Shabbat starts with prayer and lately it has fallen to me to choose the music for the prayer before the Siddur Service. Usually enough music is chosen to last for fifteen or twenty minutes of quiet private prayer. By the time those who are led to public prayer are finished, an entire hour will elapse. From that point we go to the "service of the heart" in the Siddur. This season of Appointed times have been very fulfilling! Three seventh day Shabbats were in the mix! Right after Rosh HaShana we had Shabbat Shuvah (6 Tishrei 5777-10/8/16) then the Shabbat between Yom Kippur and Sukkot (13 Tishrei 5777-10/15/16). Lastly Shabbat in the middle of Sukkot, Chol Hamoed Sukkot (20 Tishrei 5777-10/22/16). On the morning of Shabbat Shuvah I was pressed for time and even though I had spent my morning (5:00 am) in prayer, I felt distracted as I sat to pray and pick the music for the service. As I looked over the list and started making choices, the Ruach led me to a completely different set of songs, which being obedient I chose. When we went to the readings for the day (Torah, Prophets, Brit Chadashah), I was shocked and then in tears realizing that the exact words of one of the songs was read from our reading for that Shabbat, pulling the song and reading into tandem-what a blessing. The thought shot through me: What if I had chosen to ignore -The-VOICE- and choose the songs I had wanted! When I hear the Ruach and without questioning hear and do, it melts my spirit into tears of gladness and thanksgiving. I hate to think how many times I may have missed hearing and NOT acted! YAH teach us your ways! On the next Shabbat between Yom Kippur and Sukkot, I was not surprised but was again in tears when the words of the music exactly matched the readings for that Shabbat. So now we have two Shabbats; a pattern! So on the Shabbat directly, the day before Hoshana Rabba our music given by The Ruach was one song played twice that linked the water of Psalm 42 and John 7:37. We serve an awesome Creator who has given us our Mashiyach Y’shua and fills us every minute of every day with the living water of His Ruach. Praise HIS Set Apart NAME! May we all take the time to pray, Listen and read HIS word serving YAH in love! I pray that the song blesses your prayer time as it did for us on Shabbat! 37. Now on the great day which is the last of the feast. Y'shua was standing, and he cried out and said, "If a man thirsts, let him come to me and drink. 38. Anyone who believes in me as the Scriptures have said, rivers of living water will flow from his belly." 39. And this he said concerning the Spirit that they were about to receive, those who believe in him. For the Spirit was not yet given because Y'shua was not yet glorified. 40. And many from the crowds who heard his words were saying, "This is truly a prophet!" 41. Others were saying, “This is the Mashiyach!" and others said, "Does the Mashiyach come from Galeela? 42. Does not the Scripture say that from the seed of Dawid" and from Beth-Lekhem the village of Dawid comes the Mashiyach"
3. 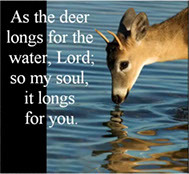 I am thirsty for God, for the living God! 6. My soul, why are you so downcast? 12. My soul, why are you so downcast?